President Joko “Jokowi” Widodo has confirmed Indonesia is ready to help resolve the Rohingya issue in Rakhine, Myanmar. He referred confidently to the ongoing process of giving more responsibility to the ASEAN Coordinating Center for Humanitarian Assistance (AHA Center) for exploring the steps and types of cooperation needed for repatriating the Rohingya from Bangladesh to Myanmar. The AHA Center is ASEAN’s current entry point into Myanmar. Usually Myanmar uses bilateral relations with some ASEAN member states or communicates through the ASEAN chair. This time it is through an ASEAN body, the first time that ASEAN leaders have given one a mandate beyond what has been given to any other ASEAN body. This reflects how some in ASEAN are pushing for a more visible way for ASEAN to engage in Myanmar’s issues. Given ASEAN’s operating principles of consensus and noninterference, the rather swift agreement among ASEAN leaders to expand the AHA Center’s mandate suggests a promising direction for ASEAN engagement on Rakhine. Currently ASEAN needs to tackle both the humanitarian and human rights dimensions. 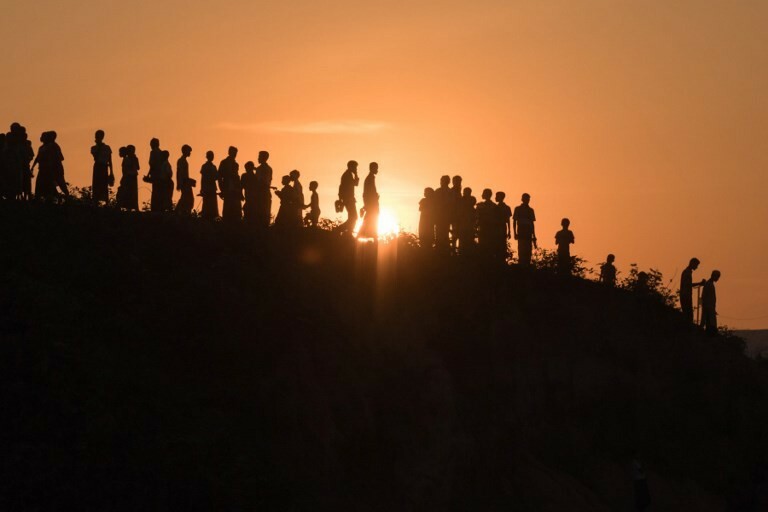 The AHA Center takes care of the humanitarian dimension, but the human rights aspect on Myanmar remains strongly avoided.Ironically, besides Myanmar a few other ASEAN member states are also encouraging Myanmar to avoid any dialogue over Rakhine in the ASEAN Intergovernmental Commission on Human Rights (AICHR). In the AICHR between 2016 and 2018 only Indonesia and Malaysia dared to continue voicing the human rights issues involving Myanmar. Other countries either choose to be quiet or to wait and see while a few countries openly endorsed Myanmar’s position to only share limited information. Those representatives who supported Myanmar’s refusal to discuss anything concerning human rights are saying they are not interested in hearing any updates or information from Myanmar and therefore no other countries “can force” Myanmar to work on the Rakhine issue within the AICHR. Indeed, words such as “force” are often used, leading to a negative sense of human rights, which actually have so much to offer for bringing peace and stability to Myanmar. This is outrageous, as initially Myanmar’s representative to the AICHR was quite amicable about sharing information and updates on Rakhine and the Rohingya with other representatives in informal meetings. Therefore, we cannot merely accuse ASEAN of immobility in working beyond the humanitarian approach on Myanmar. The year 2018 has been the toughest, because despite Myanmar’s request for help from ASEAN in April, at least one member actively rejected any discussion on Rakhine within ASEAN. That was why I and Edmund Bon Tai Soon, AICHR’s Malaysian representative, issued a joint media statement on April 23 to attract attention from ASEAN authorities who were meeting that week in Singapore, stating that ASEAN engagement was urgently needed. No country could pass the buck on human rights in this situation. However, we could not reach any consensus on the issue with other AICHR representatives. Myanmar is clearly challenged. I cannot say confidently whether the authorities in Myanmar genuinely care about implementing the recommendations of the late Kofi Annan, who chaired the international advisory commission on Rakhine. Myanmar’s reaction to the United Nations Independent Fact-Finding Mission on Myanmar suggests the government simply thinks they are not doing anything wrong. The government thinks what happened inside Myanmar’s borders and whatever the military does to restore order are not to be questioned by any other countries. Denials of any human rights violations are also reflected in Myanmar’s frequent establishment of its own fact-finding missions — eight since 2012. The latest was formed in August 2018 and is to conclude its work by August 2019. This week Indonesia again hosts the Bali Democracy Forum (BDF) scheduled for Dec. 6 and 7 with the theme “Democracy disfigured and the prospect for prosperity”. Myanmar today shows how hard it can be for the citizens of nondemocracies to even imagine the happiness and satisfaction of living under a democracy. For Myanmar’s leaders, voices of nongovernment actors and discussions on human rights are seen as highly unnecessary force or pressure. Some even say I am hindering the growth of prosperity by opening too much room for dialogues on human rights. Technological disruption, the opening of many new markets and the protectionism of the more developed economies are seen as reasons for states like Myanmar to place democracy as their last priority. This is why democracies must work together. Democracies cannot afford to be disfigured and leave openings for excuses by nondemocratic regimes to undermine freedoms and rights that have brought hundreds of millions out of fear, torture, forced choices, arbitrary arrests and poor quality of living — including some 260 million Indonesians. Indonesians have swallowed the bitter pill of living under a nondemocratic regime, and we learned that human rights work just fine with prosperity. We should all continue working tirelessly, not just to open minds in Myanmar, but also in neighboring countries with limited imagination about the beauty of a human rights-based approach for handling the Rohingya issue. This is ASEAN’s test for its commitment to the ASEAN Charter, which states that human rights are an important part of the ASEAN community. It’s not just the job of Indonesia to make Myanmar welcome human rights; the more stable economies around it and those attending the Democracy Forum should be part of this journey. The writer is the Indonesian representative to the ASEAN Intergovernmental Commission on Human Rights. The views expressed are her own.